The latest summit of the OpenStack community was held in Boston on May 2-6, 2017. It attracted 5,000 attendees from 63 countries. The first of these forums was held in 2011 with just 600 attendees and the community has grown rapidly. OpenStack was formed by NASA and Rackspace with an objective of making mega datacenter technology, deployed by Internet Content Providers (ICPs) such as Amazon and Google, available to a broader set of enterprise customers. The use of white boxes and open-source software offers a lower cost alternative to the traditional proprietary enterprise hardware and software from Cisco, HPE and Oracle. Patrick Weeks – a keynote speaker from General Electric – summarized it passionately by saying “have not we paid enough to our equipment partners already?” Jonathan Bryce, Executive Director of OpenStack stated their mission as “achieving cost savings (enabled by Cloud technologies) at a smaller scale”. Edward Snowden was a guest speaker at the event, video conferenced in from Russia. He encouraged software developers to work with “the free spirit of technology in mind” and not to conform to the interests of large corporations and governments. He compared software engineers of the 21st century with nuclear scientists of the 20th century in terms of their impact on global security. Mr. Snowden’s speech was well received. It was passionate, idealistic and a bit tragic. Comments by Mark Collier moderating the event did not help. 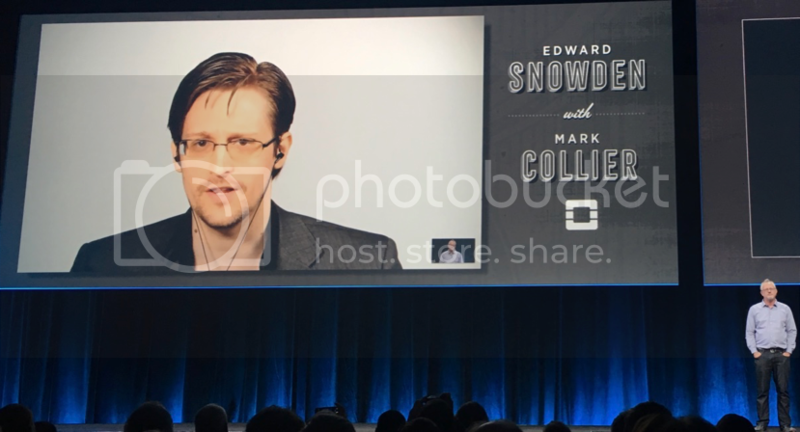 He welcomed Mr. Snowden by saying “too bad you can not join us in Boston” and ended by inviting him to the next event in Sydney. These software geeks have no manners. Politics aside, the free spirit of technology was obvious at the event: the freedom of innovation, the liberty of the open-source community. The fulfillment of creating something new, while being part of a vibrant community of fellow software geeks, is inspiring. Cisco, HPE and Oracle are members of Openstack, but there were no keynote speakers from these companies. Speakers from Rackspace and RedHat dominated the stage. Ironically, these two companies are now earning billions of dollars in annual revenues after several years of rapid growth. New large corporations are replacing the old ones to the disappointment of Mr. Snowden, but what is the alternative? Quoting Sir Winston Churchill “capitalism is the worst economic system, except for all the others”. What is behind the success of Rackspace, RedHat and many other smaller vendors embracing the OpenStack approach? These vendors cater to large and mid-size enterprises that are trying to replicate the methodology developed by ICPs for public clouds and transform their datacenters into private or hybrid clouds. Many of these first attempts failed since the transformation proved to be too radical. Vendors led by Rackspace come to the rescue and offer managed private cloud services. They bring expertise in building datacenters using white boxes, open-source software and put clients on a path to scale up their private clouds, using a radically new approach. Stitching together a solution from an existing infrastructure using internal resources did not work for many of their customers in the past. Easystack, a Chinese start-up company, also presented at the event, as it starts developing business in the US. The company has more than 100 customers in China, benefiting from the government policy on the adoption of Cloud technologies in China. Many governmental and private enterprises in China are starting to move their IT operations to the Cloud. This trend is likely to accelerate in 2017-2019, according to the new Cloud plan released by the Chinese government that calls for tripling the size of the cloud computing industry in China over the next three years: http://www.isvoc.com/20170427742.html (The link includes an English translation at the bottom). Anni Lai of Huawei commented on the increasing number of Cloud business opportunities around the world. Many governments, local telecom service providers and enterprises are looking for help in developing Cloud infrastructure and services. In many of these cases, the public Clouds offered by leading ICPs are not viable options. Data security and conforming with local regulations are some of the barriers for adoption of public Clouds worldwide. LightCounting placed AT&T and Verizon as the top risk takers in the report titled “How Cloud Services and Cloud Computing are Changing Service Provider Networks” published in February 2017. However, the Chinese operators are now catching up fast. All of them are very active in the Openstack community. China Unicom was just elected to a seat on the community’s board. The Chinese government’s new Cloud plan, mentioned above, just adds even more urgency to their efforts.